Who are lucky marketers? The ones who rake mullah from one time investment?! Yes, definitely they are the ones, who can call themselves lucky. 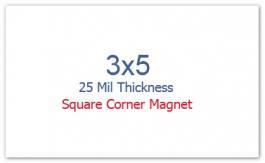 Today, many such advertisers ultimately call themselves lucky by investing in this promotional 3x5 inch printed square corner full color magnet – 25 mil. As, it is made up of highest quality magnetic raw material, possesses longer shelf life and offers larger creative space for advertisers to work upon. 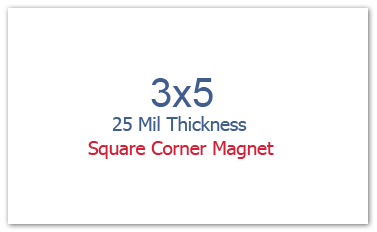 A custom 3x5 inch printed square corner full color magnet makes a good business promotional choice for advertisers who don’t wish to let any mass marketing opportunity go out of their hands. A personalized 3x5 inch printed square corner full color magnet can be positioned as a business card magnet, calendar magnet, announcement token, business save the date magnet, etc.